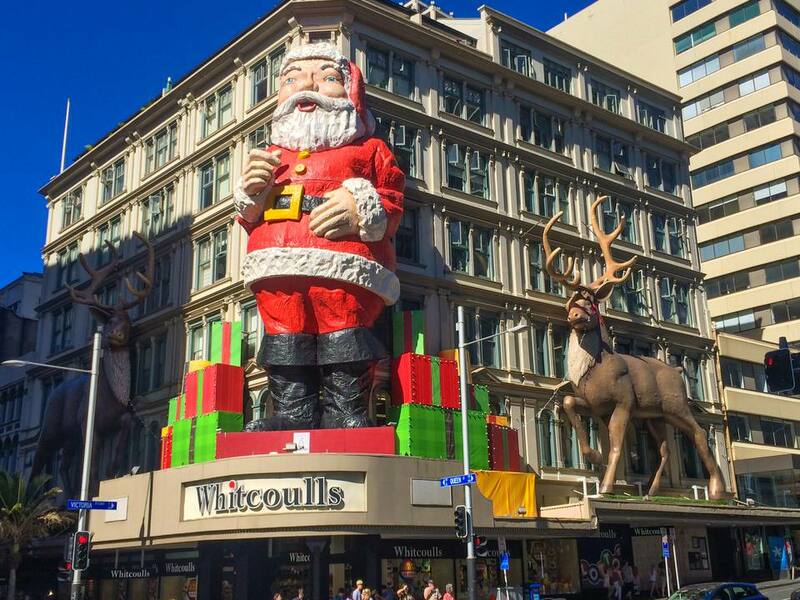 For visitors coming from the northern hemisphere, Christmas is somewhat different in New Zealand. Due to the country's European heritage and roots (especially British), tourists will see many of the same traditions observed—with a twist. Include a different climate, and the Kiwi Christmas is something unique, and it can be a lot of fun for those coming from abroad. The most obvious difference to a northern hemisphere Christmas is the weather. December is the middle of summer in New Zealand. Many visitors from the US or Europe can't quite get their heads around having Christmas dinner as a barbeque on the beach. Christmas marks the beginning of the summer holidays for most Kiwis, so many Christmas activities revolve around summer holidays. Many towns and cities in New Zealand hold a Christmas Parade. They are usually held on a Sunday and can feature marching bands, floats, and an appearance from the grand old gentleman himself, Santa Claus. The largest and best-known parade is the Auckland Santa Parade, which has been a feature of the Auckland Christmas since 1934. It attracts thousands of spectators every year and is a great event for children. Kiwis maintain the British tradition of having a family dinner during the middle of the day on Christmas Day. The meal is usually preceded on Christmas morning by exchanging presents, which are left under the Christmas tree in the home. The Christmas feast is increasingly becoming a casual affair. Often it is a barbeque on the deck, but the traditional Christmas fare of turkey, ham, and roast potatoes are still very popular. For dessert, plum pudding, and Christmas cake are served alongside the Kiwi icons, pavolova, kiwifruit, strawberries, and cream. Most New Zealanders do not attend church regularly, but the Christmas services (particularly the Midnight Mass held at 12 p.m. on Christmas night) are extremely popular. Cathedrals (particularly in Auckland) and churches are often overflowing. There are also often other religious services held over the Christmas season. These include the Nine Lessons and Carols at Anglican cathedrals and churches. New Zealand Christmas Tree: The pohutukawa tree, which lines most of the beaches along the east coast of New Zealand flower around Christmas time. The bright red and crimson flowers make a great sight and are one of the things New Zealanders associate most with Christmas time. Christmas trees: Many New Zealanders decorate a tree in their homes with tinsel and lights in the European tradition. The most commonly used tree is the pine tree, which is found extensively throughout New Zealand. Christmas Carols: It may seem a bit bizarre to hear "White Christmas" or "Deck the Halls" in the middle of summer, but carols are popular. Expect to hear them played or sung in shopping malls in the weeks leading up to Christmas. Christmas shopping: This is the busiest time of the year for retailers as shoppers buy gifts and all the other trappings of Christmas. Summer holidays: The summer holiday break begins on Christmas Eve and lasts until the end of January. Schools are closed throughout January and much of December for New Zealand School holidays and traditionally many families head to the beaches. Christmas cards: Christmas cards are not nearly as popular as in the northern hemisphere, so don't be offended if you don't get one. New Zealand is an incredibly diverse society, and many of the cultures represented do not recognize Christmas in the same way as the early European settlers and their descendants. However, Christmas is a special time for all New Zealanders as a time to get together with the family and enjoy the New Zealand summer outdoors. So even those that are not officially celebrating Christmas will get into the holiday spirit during this time of year.